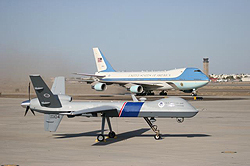 Washington, DC – On August 31, 2010, Congressman Henry Cuellar (TX-28) announced that on Wednesday, (Sept. 1) Customs and Border Protection (CBP) will begin operating an Unmanned Aircraft System (UAS) along the Texas-Mexico border in an effort to help deter illegal activity. This UAS will be housed out of the Naval Air Station in Corpus Christi, TX, which Congressman Cuellar visited last week. “Today marks a critical next step in securing the Texas-Mexico border. By positioning this aircraft in Texas, CBP can further combat illegal activity along our southern border,” said Congressman Cuellar, Chairman of the U.S. House Homeland Security Subcommittee on Border, Maritime and Global Counterterrorism. For six months, Congressman Cuellar, along with several other Texas lawmakers from both parties, has worked in coordination with CBP and FAA to bring the UAV program to Texas. The UAS will fly over the Texas-Mexico border between El Paso and Brownsville along the Rio Grande. In addition, CBP will patrol the state’s coastline along the Gulf of Mexico. The remotely-piloted aircraft, known as a Predator B, can fly for up to 20 hours and provide BP with real-time critical intelligence information from attached cameras, sensors and radar systems. According to CBP, since 2005, Predator Bs have flown more than 1,500 hours in support of border security missions and have assisted in the apprehension of more than 4,000 illegal aliens, in addition to the seizure of more than 15,000 pounds of marijuana. There will be a formal announcement at the UAS hanger in Corpus Christi on Sept. 8, 2010. Commissioner of U.S. Customs and Border Protection Alan D. Bersin and Congressman Cuellar, among others, will be in attendance. Broadcast media interested in the covering event should contact the Cuellar press team.